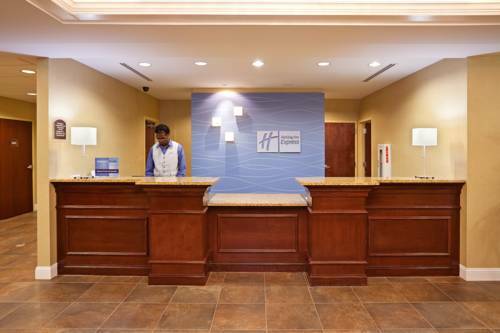 Welcome to Holiday Inn Express of Southern Pines, NC Experience our newly renovated rooms during your next visit. The sprawling greens of the areas golf country will lure you in, you will find it difficult to leave the relaxing atmosphere. Our hotel is just a short distance from 40 world-class golf courses, allowing easy travel for your stay. Whether in town for business, shopping, antiques, pottery or golf , our accommodations can be your oasis at the end of each day.Families looking to stay with us can stay comfortably in one of our spacious suites. We are also near several popular attractions such as the Southern Pines Historical District, North Carolina Speedway and west of Fort Bragg Military Base. Also our hotel is carefully designed for all types of travelers, over sized guest rooms feature a well-lit work station, complimentary high-speed and wireless Internet access and you may start each day with our complimentary breakfast. You can easily remain connected to the office through the use of our 24-hour Business Center.No matter how you spend your time with us, you may also wish to enjoy the sparkling water of our outdoor pool or in our state-of-the art fitness center. We offer a variety of golf packages all year round, so make sure to call the hotel directly for additional information! Bonefish Grill: For your seafood taste! ZAXBYS: Fast Food Chain Restaurant. Thai Orchid: Enjoy a Thai cuisine menu. Mt. Fuji Bistro: Hibachi, sushi, noodle Bistro! Raffaele Restaurant Bar & Lounge: For all your Italian taste buds! Full Moon Oyster Bar: Great fun and atmosphere with awesome seafood selections! Southern Pines Historic DistrictQuaint shopping and dining await you in the historic Downtown Southern Pines. Various shops and dining options are all within walking distance after you park! Village Of PinehurstQuaint shopping and dinning await you in the historic Downtown Village of Pinehurst. Historic shops and dinning await you in just minutes from the hotel. AmtrakAmtrak stops in Southern Pines twice a day. Mid Pines/Pine Needles Resorts2 Donald Ross Championship Courses. 30 Additional Golf Corses in the areaA varity of different golf courses within 10 miles of the hotel! Pinehurst ResortA wonderful top of the line resort and golf course. Airborne and Special Operations MuseumA great museum which is not only educational but a enjoyable time for the family. Cameron Historic District and AntiquesWonderful area to park and walk .You are able to enjoy lunch and look for antiques as well. Malcomb Blue FarmEnjoy family time and learn adventures all at once. North Carolina Zoological ParkHave a educational day as well as enjoying great faqmily time together. Town Creek Indian MoundsTown Creek Indian Mound is a prehistoric Native American archaeological site located near Mount Gilead, Montgomery County, North Carolina, in the US. Seagrove Area PotteriesMore than 100 workshops offer the finest in area pottery.